Tonight (Oct 4) at Ryerson, Colin Neufeld of 5468796 Architecture is speaking about their work. You know 5468796: I wrote about their Bloc_10 apartment project here and for the Globe and Mail. 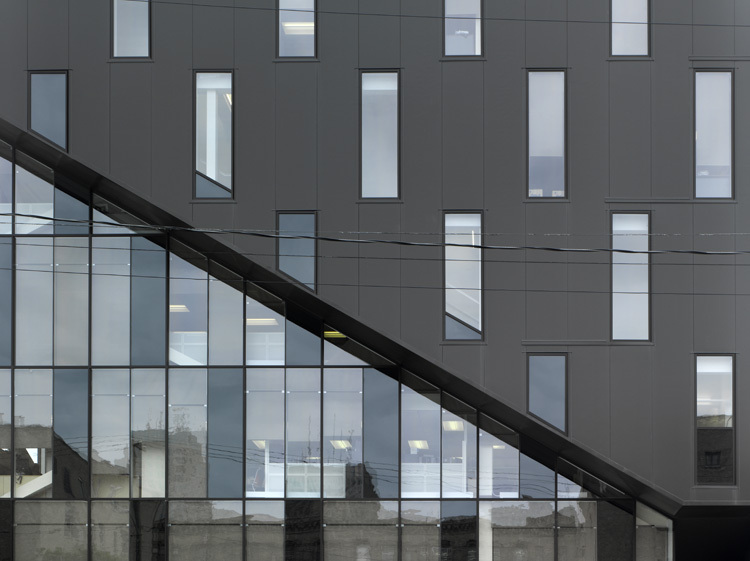 Here is another of their projects: a six-storey office building on downtown Winnipeg’s Hargrave Street for the Winnipeg Regional Health Authority. It relies on one simple, smart move to define its massing and to compose its facades. Bound by a street, a parking lot and two existing buildings, the site could only accommodate a 75’ x 75’ floor plate. 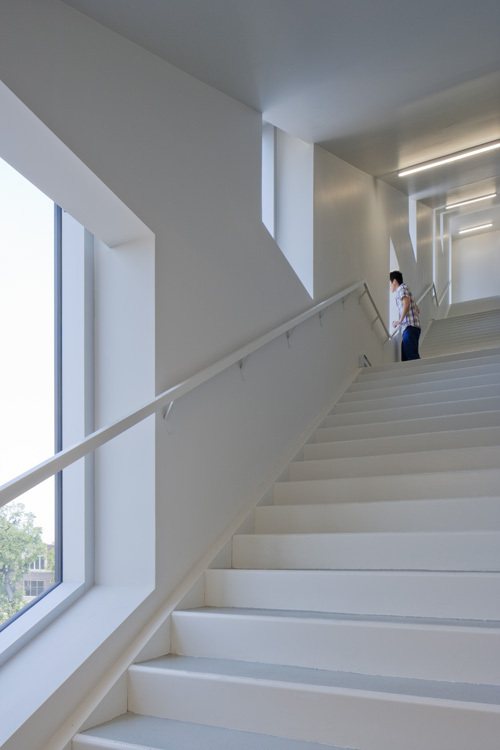 With a conventional stair and elevator core, the project would not have provided enough usable area to meet the WRHA’s requirements for open office space and access to natural light. By uncoiling the stair flights, pushing them to the building’s perimeter and allowing them to cantilever over the site’s boundaries, the project became possible. Starting from opposite corners, two staircases spiral down the building’s perimeter. The sloping stair geometry creates an unconventional massing on all four sides of the building and provides an unexpected spatial experience within. 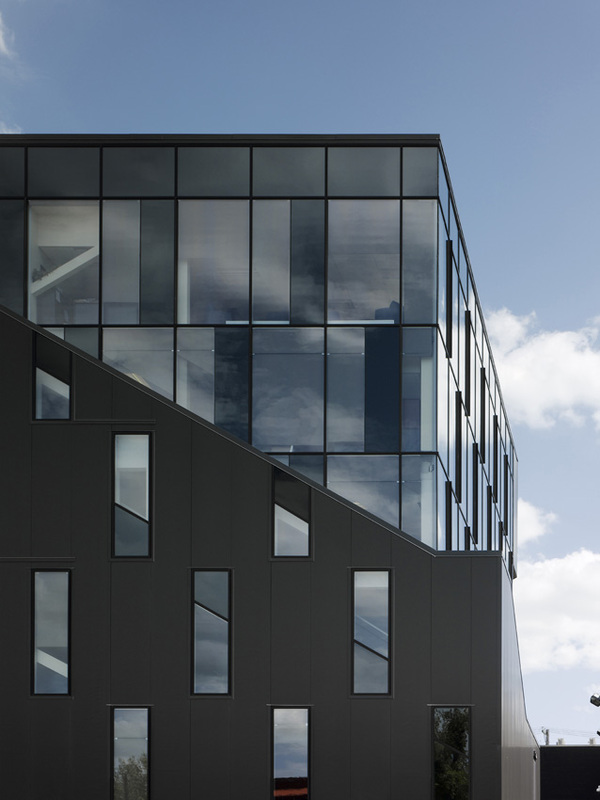 The exterior skin stretches over this geometry, with the stairs dividing the building in half and making a natural break between the more expensive curtain wall and the more economical metal cladding with punched windows. Here’s a full gallery of images at No Mean City.